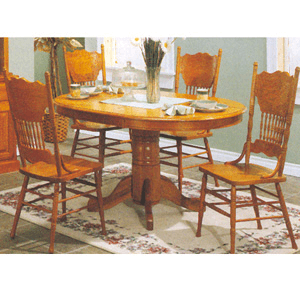 5-Pc Nostalgia Dining Set in Solid Oak. Includes Solid oak Veneer Top Nostalgia Table With 18 Center Leaf And Empire Design and 4 Solid Oak Double Press Back Chair. Details: Table 5264 (CO) : 42In - 60In L x 42In W x 30In H And Chair 5275A (CO) : 16 1/2In L x 20 3/4In W x 42In H. Chairs Are Assembled. Solid Oak Double Press Back Chair.